It’s no secret that money is leading cause of stress in a relationship and divorce as well. Talking about money is not easy in general. Relationships and marriage are definitely hard work. So when you mesh the two…well….it can get more complicated. How can we lessen the stress and make it less complicated? In this episode we discuss 4 areas to explore so mixing money and love won’t be a disaster for you. Whether you are married, in a relationship or even single you can get something out of this episode. You got to do what is right for you, what is right for your relationship at the time. Put that (money) baggage on the table so it’s there, you can have the discussion and figure out how you’re going to handle it. Remember if you have been wanting to surround with like-minded ladies while getting the support and tools you need to succeed with your finances be in the know for when the enrollment for the Fearless Money Sisterhood opens again! So let me know, what is the most pressing thing for you when it comes to relationships and money? [00:00:26.3] JH: Hello, hello, this is Jen Hemphill, your host of this podcast. I am very happy to have you here today as it means so much that you listen to this podcast. There’s hundreds and hundreds of podcast to choose from and for you to choose me and this podcast is a huge honor, so thank you so much. Happy June to you if you are listening to this as it becomes available. If you’re listening to this much later, happy day to you. This month’s episode, I’m excited about — I’m always excited about each episode but what I’m trying to do, my whole mission and you’ll see it’s just going to be a work in progress, it’s never going to be perfect but I try to pick themes each month that I focus on for those episodes but what hasn’t been happening it has been the guests. So I am trying to tweak it so the month’s themes not only the solo episodes, the ones where you just hear me talk about that them but I also touch upon that with the guest that I bring to you. That’s my whole ideal way to do those podcast. So again, it’s a work in progress. This month’s episodes are really going to focus on relationships and money. When you look at the stats, money is such a huge factor in divorces. So I have three guests lined up for you. I will also include some celebration this month as towards the end of the month, the Her Money Matters Podcast is turning one year old so I’m really excited about that. There will be a special episode for that and also, I want to remind you that if you haven’t already don’t forget to join the wait list to get notified when the doors for the enrolment for the Fearless Money Sisterhood opens. If this is your first time hearing about it, you can get all the details and you’ll be able to also join the wait list over at Jenhemphill.com/fearless. So today’s episode, this is what we’re going to talk about, we’re going to talk about how the simple word such as “ours”, “mine”, “yours” can affect how you manage your money. I will also going to share with you one huge thing that you can do to prevent financial infidelity and will also discuss slightly just a little bit about what that is and what digging into and learning how you and your partner grew up around money, how that in itself can make your life a whole lot less tense when it comes to money, and then we’re going to talk about certain scenarios that you can discuss and you should discuss with your partner just to make your life easier when these scenarios may happen or may not happen just to be prepared for that. Before we get into that as usual, I want to do a shout out and today’s shout out goes to Lindsay. She’s in our Her Money Matters community and recently she paid off some debt. Also in the process of that, she was able to save up some money to replace all the tires in her car and we know that those are expensive. Replacing tires on the car is always a pain because it’s painful in the mind too just because it costs so much. So congrats Lindsay. I wanted to acknowledge you for just an awesome job, just doing so great with that and really, to thank you as well to sharing that win with us. That means a lot. So let’s go ahead and get to the nitty-gritty of this episode. As you know, it’s no secret. Money is one of the leading causes of stress in relationships and divorce as well. Talking about money just in itself is not easy, right? Relationships on its own are work. Relationships or marriage are definitely work, it’s not anything easy and then when you try to mesh the two, you mesh talking with the marriage or with the relationship, well, that can get more complicated right? So how can we lessen that stress and make it less complicated? There are four things that I’ve come up with that I feel you should consider so mixing money and love won’t be a disaster. There aren’t in any particular order, all right? So the first one that I wanted to talk about is what words you’re using. How you and your partner view money in terms of the relationship, is the money ours? Is the money yours? Is the money mine? How do you and your partner view that money? Because that’s going to affect how you manage your money, it’s also going to affect if you see the money that you make as yours, chances are you each have your own accounts and maybe agree to pay certain bill from those certain accounts or maybe the money is ours. So you work more as a unit in terms of all the money going into one account and the bills being paid from that account. But having this, just this alone right here, knowing what word you use, how you view your money in terms of in the relationship, it’s going to help you not only handle the conversation so much better because you are aware of it but you’re going to have clarity as to how you manage your money as well. So again, I talk about in terms of like, are you having a joint account because you’re married or you’re in a relationship, that’s where your money is yours? Is the money just mine and yours? How do you view that? That’s really, I feel, critical to understand and be aware of. It’s a simple conversation, you probably already know the answer to it without having to have that conversation just listening and having had those conversations in the past with your partner, you’ll know. You already know how you view, but just being aware of it is going to make your life a lot easier and make just managing — being able to decide how you’re going to manage your money. Again, as I mentioned before, there’s no one way that’s the correct way. You got to do what is right for you, what is right for your relationship at the time. Sometimes that will evolve and how you manage your money and how you distribute your money as far as whether you have joint accounts, separate accounts that can evolve in time as well. I have seen that happen. The second thing that I think is important is understanding, not just understanding but really being honest on what money baggage you’re bringing into the relationship, into the marriage. Are you bringing some debt? Maybe you’re dealing with child support, alimony or whatever the case may be, it’s important to be honest up front just before you get into the relationship. If you have been already married for a while, maybe that was a conversation that you had prior to getting married or maybe you got married and you found that out. You can reflect on how that made you feel or what kind of tension that caused. I know it’s not easy, but just being honest and putting that baggage on the table so it’s there, so you know you can move on, you can have the discussion, you can move on and figure out how you’re going to handle that, the debt. I know for us, my husband had a really, really difficult time when we got married on him bringing in some student loan debt. That was tough on him, emotionally, that he felt guilty bringing it onto the marriage but we had that discussion and for me, I know that this is weird or maybe nerdy to say but for me, it was a challenge. I’m like, “Oh now we can figure out how to pay this debt,” I don’t know, don’t ask me why I thought that way but that is just me. I had no problem because he was my husband and for me, we work as a team and we can figure it out together. It’s also being upfront and honest from the beginning is going to help you prevent from “committing”, if you will. I don’t know if I want to use that word, but that’s the first word that comes to my brain — financial infidelity. If you haven’t heard that term before or you have probably heard infidelity but financial infidelity really simply is just lying to each other about money. So maybe hiding some debts, maybe you or your spouse took a credit card on your own and are putting some debt on there, whatever the case may be. So being honest from the get go is going to help you prevent that because you already had that hard conversation, that tense conversation about whether you had debt before the marriage or whatever the case maybe is going to help you have another difficult conversation down the line. And therefore is going to help you prevent that financial infidelity on both sides. It’s going to help open up that conversation as far as both being comfortable because one came clean with whatever it maybe, bringing debt or whatever you want to call it and then it just opens up the conversation and the comfort level. To be able to talk about that and therefore, of course that’s going to help you prevent financial infidelity in the future. Because that definitely affects how you handle money today and you need to be aware that not just your money story but your partner’s money story. That’s going to help you have those conversations especially that initial one if you have learned, not necessarily won’t be the initial one depending on whether you are already married, you have been with this person for a while but having that conversation about each other’s money story is going to open up just like the money baggage, being up front with the money baggage is going to help future money conversations because talking about money is already hard enough as it is. So it’s going to help you alleviate and lessen that tension when it comes to money because you already have learned about how you each have grown up around money. You have understood why you each handle money in the way that you do, whether you’re a spender, whether you’re a saver, whether you don’t like to budget at all maybe there’s a reason behind that, whether you are adamant about every single coupon and you will only go grocery shopping if you have coupons, whatever that may be there’s a reason for that. So you have to really know what each other’s money story is. How you grew up around money, that’s going to help you tremendously. The fourth thing that I felt was really important was just to understand or to discuss certain scenarios and understand what you would do in those scenarios. So one could be if there’s only one breadwinner in the family. Maybe you’re the breadwinner or your spouse is the breadwinner and how you each feel about that. Let’s say you’re not the breadwinner, maybe your spouse is the breadwinner and you decide to stay at home to take care of the kids, right? That’s a common one, so how does your spouse and how do you feel? Does your spouse feel like you should be bringing in some money and pitching in or is your spouse completely okay and very supportive? On the other side if you stay home are you feeling guilty for not bringing in money? You have to have those conversations about these scenarios. One is just only one being the breadwinner and the other one not bringing any money. Right? The other scenario that I think is important is if you’re both working and especially since you know women and men, we’re so different but let’s say in this case, you are bringing in more money than your husband. So talk about that and how does that affect things or is it really not a relevant thing. In some cases, it’s really no big deal. In other cases, the male might feel, they shouldn’t I don’t think, but the male is going to feel like he should be making more money because the traditional role of the male is the breadwinner right? So have those conversations about that. Another scenario is if one of you loses the job, what do you do when one loses a job? Have those conversations. It can go any way in that conversation. There’s not one specific question that you ask but just talk about it, “If one of us loses the job, what do we do?” Because you don’t want to have that happen and I’m not here talking about preparing. I am not talking about emergency funds or preparing in case something like that happens. I’m talking about the feelings that you have. If this happens, how could you possibly feel? How will that affect your relationship with each other? This is the conversation that I am talking about. Of course, preparing financially just in case with an emergency fund, that’s another conversation. What I’m talking about here is how emotionally that will affect both of you and you have to have those and you talk about it ahead of time so that way if that happens, you already know and you’re prepared ahead of time. The other scenario is because there’s always that one family member that asks for money right? Have you experience that before? There is that one family member that needs money that comes to you for money. So talk about the scenario, how do you handle this? Are you going to have parameters or do you not lend them or give them money? Is there a certain amount that you won’t go over to give them money? Is it just a onetime gift? How are you going to handle that when a family member ask for money? Because that and especially if it’s your family member and you love that family member and you want to help, what if your spouse doesn’t or maybe they have issues into giving the money? You have to have those conversations so you know how each other feels. That’s going to prevent a lot of heartache in the future if that happens right? The other scenario to talk about is how do we handle aging parents? In episode 32, I discuss more about this but the reason why I bring this up is because we’re not getting any younger, of course our parents aren’t either. Eventually, they’re going to need some sort of support and if you have discussed the scenario especially if you have two sets of parents that are living, you want to know how do you handle those things? When they need them financially, what are you going to be able to do to financially support them if that’s the case, what kind of other support whether physically, they’re going to be living with you or whatever the case maybe, have those types of conversations for those certain scenarios and come with some sort of agreement, some middle ground with this so later on down the line, you already had the discussion and it’s going to alleviate stress. It’s going to alleviate arguments, you’re going to be able to make the best decisions at that time not only for you all but financially as well instead of focusing on the stress of the argument or the stress of the conversation. So those are the four things that I think are essential when talking about mixing love and money. So I hope you have found that of value and let me just go ahead and recap what they were. One was about understanding the words that you use such as ours, yours, mine and how that affects how you manage your money. The second one was about being honest and just being upfront about the money baggage that you bring to the table and how that helps you or prevents you from financial infidelity in your relationship and also knowing each other’s money story and how important that is for your marriage for money conversations, for being able to talk about that so much easier. And the fourth one was really we talked about different scenarios that you should discuss to be able to have these discussions, come to a middle ground, come to some sort of agreement, come to some parameters on how you would handle things, some rules so that way if these things were to happen, you’ve had this conversation already. It’s going to alleviate the stress and the arguments later so at that time, you can make decisions solely based on what’s going on versus the emotional piece. You’re going to have that out of your brain and you can focus on making the good decisions for you not just the decisions but also the financial decisions that you will have to make. So that is it. 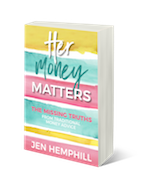 If you didn’t get the link at the beginning about the wait list for the Fearless Money Sisterhood, its Jenhemphill.com/fearless. You will also find the link over in the show notes as well. Next week on episode 53, we’ll have our first guest for this theme of relationships and money and we’ll be getting to know her and about how they’ve handled marriage and money and so much more. So that is it. 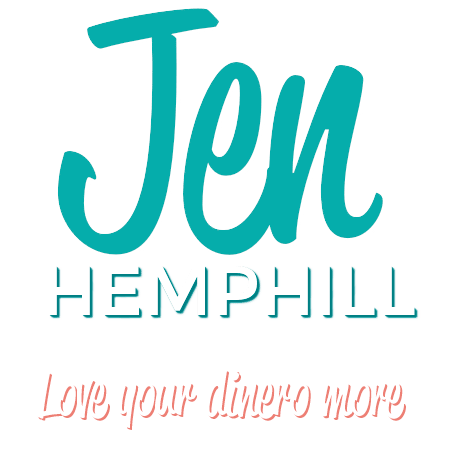 You can check out all the show notes at jenhemphill.com, all the show notes, they’re very brief right? You can check out the show notes at jenhemphill.com/52 so you can get the link, you can read the transcript if you want and I appreciate you listening and we’ll talk again next Thursday.